There is no doubt about it… I have spring on the brain! The weather this week is supposed to be terrible (think rain, clouds and freezing temps every day) so I’ll be stuck inside dreaming of somewhere tropical. I’ve already ordered a few items on this list for spring, including this belt bag, these fabulous earrings and these Tory Burch sandals. I can’t WAIT for the sandals to arrive (I’ll of course show them to you when they do). I looove all the variations of neutrals this year, the trend for spring is to keep the clothes simple but really shine with the accessories! Especially scarves, you’re going to see them everywhere this year – wrap them around your ponytail, in your hair, or around the handle of your straw bag. I’ve already been collecting a few, but I love this leopard one in particular! Did everyone have a good weekend?! Chris and I were SOOOO lazy! We watched an entire series on Netflix along with a few movies. I don’t think I even changed out of my pajamas on Saturday! It was much needed. Anyway, I have some fun content planned this week so stay tuned! Ahh yes, I really need spring to arrive like right now! Pretty sick and tired of this winter weather by now… anyway, you picked out some really adorable things here, those definitely brightened my mood! 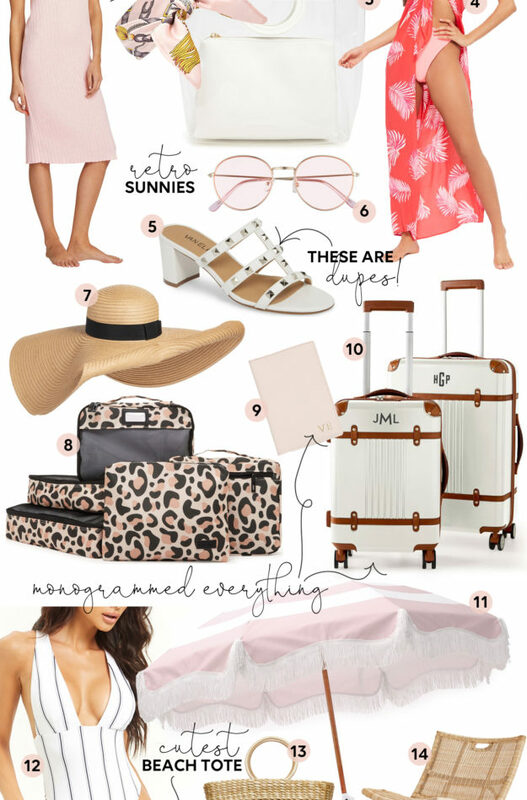 That white scallop bikini is just adorable and I can not wait how the Tory Burch sandals look in person – or in a blog photo haha! Happy that you had a weekend to just chill, we all need that from time to time! What did you watch on netflix? Yummy Mummies! Kind of a crazy show haha but HIGHLY entertaining!! Loving all of your spring picks, especially the Tory Burch sandals 😍 My favourite days are days when I don’t change out of my pyjamas, it’s like recharging my batteries! ahhhh I am dying over that bathing suit & hat! I’m so happy you were able to have relaxing weekend – Lord knows you deserve it, girl! Thanks for sharing your favorite picks for Spring so far! Looking forward to the content coming up! I’ve been wanting spring for a while now. I just bought a whole new spring wardrobe to encourage the weather to be warmer. Also I’ve been loving hair scarfs and ponytails and love that they are so popular right now. Will you do a book review? I would love that!! Oh I want wait for spring! So ready for it! So many great finds too Caitlin! Those sandals are super cute! I’m definitely ready for spring since we’ve had a winter storm three weeks in a row! I honestly haven’t had any of my college classes for two weeks! Warm weather and sunshine can definitely come any day now!